A romantic wartime drama, Waterloo Bridge is a classic tale of love found and lost under exceptionally strenuous social circumstances. 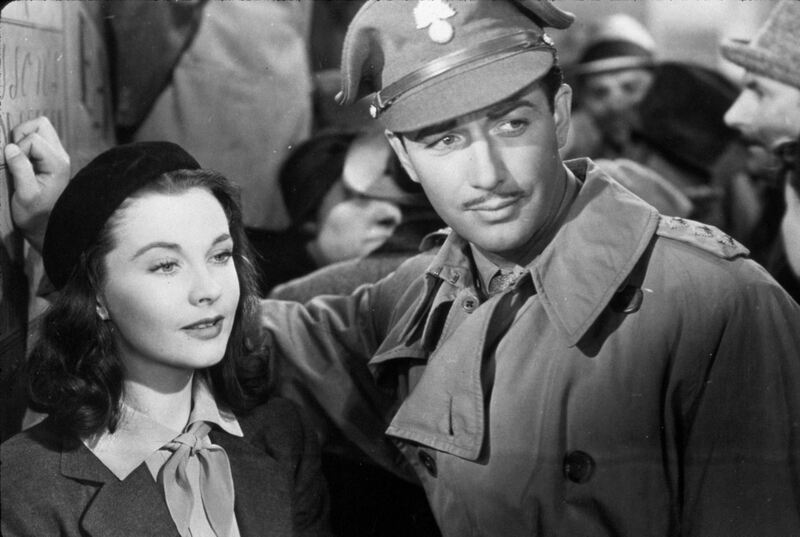 It's the start of World War Two in London, and army colonel Roy Cronin (Robert Taylor) is about to travel to France. He pauses on the Waterloo Bridge to recall his romance with Myra Lester (Vivien Leigh), back from his younger days as a Captain in World War One. Roy and Myra met on the bridge during a German bombing raid, and made a dash together to an underground shelter. She was a ballet dancer, he was on a brief leave from the front. After a whirlwind couple of days, they commit to each other, but he is shipped back to the trenches before they can get married. With Roy gone, Myra and her friend Kitty (Virginia Field) fall on hard times, after quitting the ballet school and their domineering dance teacher Madame Olga Kirowa (Maria Ouspenskaya). An introductory meeting between Myra and Roy's mother Lady Margaret Cronin (Lucile Watson) goes horribly wrong when Myra is shaken to her core by a mistaken newspaper report that Roy has been killed in action. Myra and Kitty do what they must to survive, before Myra's world is rocked again by Roy's return. 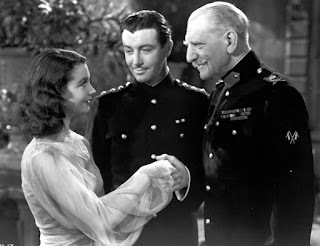 Directed by Mervyn LeRoy, Waterloo Bridge adapts the Robert E. Sherwood play with emphasis on the mystical qualities of a love meant to be, and the broader forces of both unintended and deliberate interference. With practiced poignancy, the film tackles issues of separation, perceived and real snobbery, class divides, the grim prospects of women left with no support during war, prostitution (without quite mentioning the profession) and the clash between foundational lies and seemingly indestructible love. In crisp black and white, LeRoy creates a fragile but tender bond between the dashing army man and the innocent and orphaned ballet dancer. While all looks ideal, the first part of the story hints at problems dormant below the surface. Roy is from a family of upper Scottish nobility, while Myra has already been buffeted by life and carries a surprisingly fatalistic outlook. Their love is true, but his commitment to the army and her lack of a family are fissures in the foundation. The second half allows the cracks to spread and undermine the magic of romance. The chasm between tainted ex-ballerina and blue blood aristocracy is not an easy one to straddle, and before much is known about Myra, most of Roy's circle of family and friends are gossiping that she is not worthy, even as she dances among them. Myra does have allies in the form of Lady Margaret and The Duke (C. Aubrey Smith), but ultimately the most perilous threat comes from internal demons, always lurking and given a boost by war's cruelty. Fresh off her world wide stardom as Scarlett O'Hara Vivien Leigh is luminous as Myra, and brings an unusual depth to the role. Behind the eyes of the innocent young dancer is a gathering darkness, and Leigh perfectly captures the dilemma of a woman falling into a love that must be impossible. Robert Taylor is steady as Roy Cronin, finding the bulletproof confidence and pushiness of a soldier eager to fast-forward life. A time of war shuffles the social deck. Myra and Roy only met on Waterloo Bridge because of the chaos of an air raid. But the same conflict will mean their happiness is threatened, and two lovers will need to battle against overwhelming odds to maintain what they found on the bridge.